Last weekend was the 5th annual Indie Craft Parade here in Greenville, SC. This is a top notch festival of all things handmade, and is always my best show year after year. With a record number of attendees this year, nearly 7,000 people, it’s no wonder it was a huge success for all involved. A lot goes into preparing for a major show like this. I worked all summer making inventory and still felt like I didn’t have enough by the time September rolled in. The week of the show, I mainly focused on tweaking my table setup, and finalized some new additions to my display to ensure my booth would look it’s best and function well for the crowd of shoppers. I always do a mock up prior to this show (that’s what the dining room is for!) and that, plus carefully packing up what is essentially a miniature store, is a several day-long endeavor. The checklist is never ending! The day before the show, I got an unexpected opportunity to appear on Studio 62 with Jamarcus Gaston to talk about the festival and my handmade business. This was my first time on TV and I was shaking like a leaf, but I’m thankful for the chance to plug this amazing event as well as share my work. Here’s the video clip. Friday September 12th was the day of set up. All the vendors showed up at assigned times to unload, and the anticipation was there from the get go, long before the VIP Gala kicked off that evening. I did a series of live posts throughout the day Friday to give a behind the scenes look at what all goes on before the doors are open. Click here for photos. To say the show was a success would be a huge understatement. I’m not just talking record sales or attendance. Everything about the event was extremely well organized, widely publicized, and I felt energized even though I was utterly exhausted by the end of it. 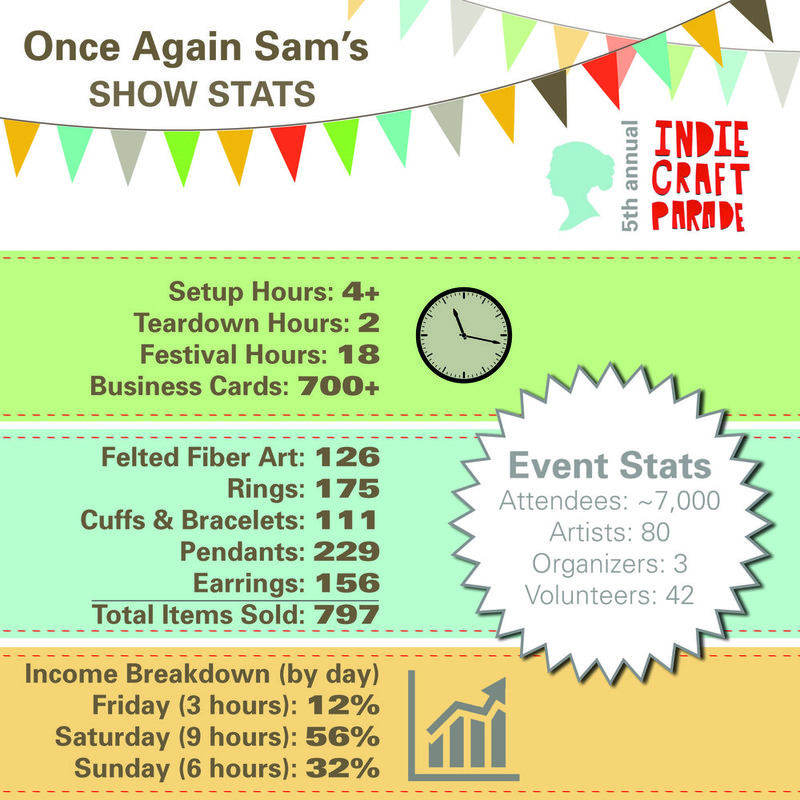 Below are some of my stats from the weekend, but I’ll just point out, this show is a complete anomaly - I DO NOT sell almost 800 items at every craft show I do! Not only did I sell a lot, but I bought a lot too. That’s half the fun, right? Here’s a peek at my Indie Craft Parade loot from some of the most talented regional artists. I could have bought something from just about every vendor. I had a hard time narrowing it down to these awesome items! Thanks to everyone who made this event so special!